Not many of us were born with the perfect smile. An attractive smile emits beauty, confidence, happiness and youth. If you are dissatisfied with the appearance of your smile, we have solutions for you at Riverheart Family Dentistry. Dr. Schwarz is a talented dentist who can create natural, balanced and dazzling results in cosmetic dentistry. Our dental team stays up to date in the latest cosmetic dental techniques and we use state-of-the-art tools to give patients lasting and gentle solutions to improve their smile. 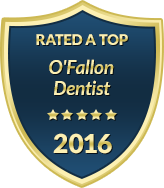 When choosing our dental practice in O'Fallon for aesthetic corrections, you will find that we go out of our way to ensure your experience is both comfortable and rewarding. Our office environment is equipped with modern patient amenities, our staff is friendly and compassionate and our treatment rooms include advanced dental technology and sedation dentistry options to keep you fully relaxed as we transform your smile. Thanks to modern technology, a smile makeover can often be completed in just a few visits, with minimal sacrifice to your schedule. For patients that want a simple correction, such as teeth whitening or bonding, you can achieve significant improvement in one easy appointment. By providing a wide range of cosmetic dental services, we give patients lasting cosmetic solutions that fit their schedule and budget. In fact, to make your smile enhancements more affordable, our office offers flexible payment options and financing plans. Contact Riverheart Family Dentistry today to schedule your cosmetic dentistry consultation. We want to hear your smile concerns and offer an attractive solution so that you can smile brighter through all stages of life.